Samsung continued its strong support of VR at the Barcelona Mobile World Congress. However there were no game-changing announcements. live cast the session via Gear VR. In addition, the pre-order bundle includes a free Gear VR! 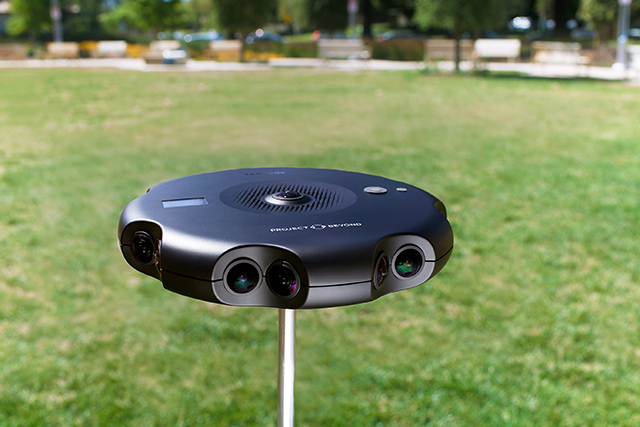 While mentioning the Project Beyond camera briefly, referring to it as available for "professional" use, Samsung introduced a new consumer VR camera, with two hemispherical lenses, allowing full spherical 360 x 180 degree coverage. Each hemisphere has a 1920 x 1920 pixel resolution. The S7 can be synced to the camera and will automatically stitch the image to a 2940 x 1920 video. It was not entirely clear, but it seemed as if the video can even be streamed live from the phone to a remote Gear VR. The Gear 360 camera should be available later this year.